Intel's 'Classmate PC': a Missed Opportunity for Apple? 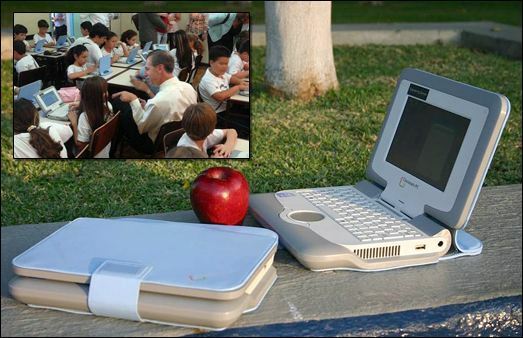 COMMENTARY: (3.27.07)-- Last week we told you about a school in the San Francisco Bay Area that was using Apple technology to connect with students, enabling them to stay in school while not physically being there. By coincidence, on the same day that TV news story aired, Intel announced in a press release that, "...Intel-powered classmate PCs are shipping in volume to emerging markets." Most of us know that Apple and education kind of go hand-in-hand. What student hasn't gone through school without ever having been exposed to a Macintosh computer in the school environment and then goes home to a Windows-based PC when they're away from the educational setting? Very few. Second? It further adds to the credibility of a possible 12" ultra-portable--the return of one in better form--from Apple Inc. But let's get back to the main story at hand. News of this new Intel "classmate PC." "The Intel-powered classmate PC supports collaborative learning environments primarily for K-12 schools and is part of Intel's on-going commitment and dedication to equip children around the world with technology that will help advance learning and development." Does that kind of smell like a bushel of apples to you? You'd think that statement was coming from Cupertino themselves. The press release further states that, "The Intel-powered classmate PC is part of the Intel World Ahead Program to tap the combined power of technology, curriculum and teachers to improve education in developing countries." Intel says they will be working with those countries to provide access to the World Wide Web, give educators professional training on how to better use and incorporate technology into learning, and through technology, enhance the teaching and learning of math and science. Intel's vice president for sales and marketing, Willy Agatstein says in that press release, " 'Intel has a long history of supporting education initiatives driven by the belief that technology can open the world's opportunities for students.' "
He adds, " 'Our goal is to provide students with the 21st-century skills they need... to help ensure that they're prepared to succeed in the knowledge-based economy. We expect Intel-powered classmate PCs to be an important device to help in education as well.' "
Sounds like God himself, uh, Steve Jobs talking. But what's a "classmate PC" already?